The transformation of nanoparticles (NPs) in physiological milieu is a dynamic phenomenon that is the subject of intense investigation. When introduced into the body, NPs can undergo a variety of changes, such as, protein adsorption, dissolution, agglomeration/aggregation, structural deformities and redox reactions. It is these changes that subsequently determine the uptake, bioavailability, translocation and fate of NPs, which ultimately determine their therapeutic efficiency, diagnostic efficacy or toxicity. 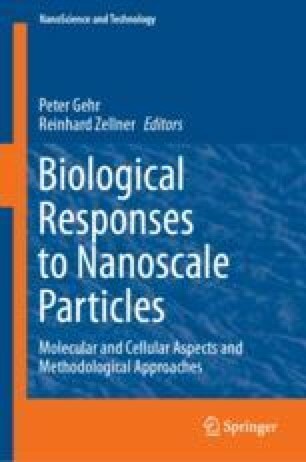 This chapter will consider the colloidal interactions at the interface of NPs with the contents of biological milieu, the practical and theoretical considerations required to modify analytical and imaging techniques to detect and, if possible, quantify NPs in this complex environment, and the requirement for a highly interdisciplinary approach to understand the behaviour at the bio-nano interface. This work was supported by the Swiss National Science Foundation through the National Center of Competence in Research Bio-Inspired Materials (WKF through the Research Program for Women in Science). The authors acknowledge financial support of the Swiss National Science Foundation (ML through grant number PP00P2_159258, BRR through grant number 310030_159847/1), the Adolphe Merkle Foundation, and the University of Fribourg. LRL acknowledges financial support from the Marie Curie COFUND Action (600375. NanoTRAINforGrowth).